You don't need to be a professional designer or a feng shui expert in order to have a beautiful, comfortable home. Feng Shui That Makes Sense takes you step-by-step through the process of using feng shui principles to create a home that will please your eye, relax your body, inspire your mind, and lift your spirit. Start reading Feng Shui that Makes Sense on your Kindle in under a minute. There are at least a dozen books about feng shui on my bookcase. Each expert has their own opinions and to be honest I was ready to give up because the "must dos" were different and contradicted each other. Then I found Cathleen McCandless' book and wow what a difference! The explanations of why the remedies of the past were used and how they may not be applicable to modern western living were such a help. Her common sense approach is balanced by the obvious respect that she has for the practice and history of feng shui. It's well written and easy to follow. There are some immediate - inexpensive suggestions that can help you get started making positive changes right away. If you were like me, interested but confused, I would highly recommend giving Feng Shui That Makes Sense a chance. So this may be a long review so I apologize because I don't often feel so moved to review a book as I do this one. Over the years my husband and I have lived in many rentals across the country due to frequent moving and a horrible home buying experience in our 20's. Well faced with yet another move and my desire to no longer live in condos, apartments or townhouses (shared walls and bad neighbors are to common for us) we decided to try purchasing again. I have read many books in the past on Feng Shui and Vaatsu in desperate attempts to create balance when our options were limited and have to say I gave up on it a decade ago. Home buying terrifies me after our one and only home purchase turned into a 15 year nightmare of which we only lived in the house 3 years of so I decided to once again look at ways to try and make sure we purchased a comfortable home. This book was completely different. She doesn't focus on placing fountains and knick knacks all over the place to bring good luck which I appreciated immediately because I cannot stand to much clutter. Her approach is about flow and comfort. There is no hanging crystals because the front door faces the wrong direction or crazy math formulas to find out my bedroom needs to be in the south west corner because lets face it when buying a home not everything can be in the perfect location and direction for my personal horoscope (yes I have read books like that). She explains very clearly about balancing yin and yang in a way that is not only easy to understand but easy to achieve. She dispels a lot of superstitions and myths and gives more rational explanations as to why you should avoid something's and how to change things in inexpensive ways. I wish she had more books on the market than just this one because I would read them all. 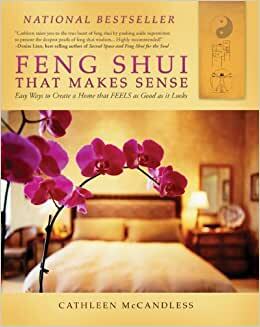 This book is a must read for anyone remotely interested in feng shui. I've done years of informal research into feng shui because its practicality fascinates me. This is by far my favorite book on the subject. There is a lot of misinformation out there that converts well-meaning people into superstitious and paranoid interior decorators (including me at some points, unfortunately). The effect is counterintuitive to what feng shui is all about, which is living in an environment that optimizes your health. This book addresses all the myths that I've come across and re-grounds you in the common sense and natural science that the practice is based on. It also puts feng shui practices into historical context, bringing it to life in important ways. Lastly the author gives really interesting, incredible (and sometimes comical) examples from her experience as a consultant. In addition to helping me nurture my home with more confidence, I can now better explain some of my interior decorating decisions to my husband in a way that appeals to his reason. Two thumbs up! It's easy to get discouraged when reading through the range of feng shui guides out there. It can seem that they contradict one another in their advice on best practice. Some are more complex than I needed and others way too "easy" to apply to be realistic. This is the book that has me really fired up about practicing this fascinating art. It is explained in a way that makes sense for the culture we live in, while not losing sight of its essential origins, and respecting the fact that there are still mysteries that we cannot fathom about energy and how things manifest. It offers the perfect combination of a common sense approach to what intuitively feels right in your home, and the actual technical art of figuring out how to enhance it, using the compass energy points as they relate to your particular surroundings. These are explained fully but simply, in a way that makes it possible and exciting to make your own blueprint feng shui chart for your home. I especially like the way the author has taken the time to research, explore and explode some of the crazy myths around feng shui, things that some books would have you adopting out of superstition, making all sorts of changes that you don't actually like out of fear that ill will befall you if you don't. This book gets to the heart of fact vs. fiction in feng shui. And that can only be a good thing. I like the conversational style and the use of examples from her own years of practice. Ultimately, the author's message is that if it feels good, then it's likely to be good feng shui. But at the same time she doesn't let you off the hook for living in a mess with clutter all around you! She gets you excited about making changes and very grateful that you did. Of all the books I've been studying on the subject, this is the best to get you started and fired up. If you only ever get one feng shui guide, this is the one that will give you all you need, in easy-to-follow, companionable language. It's like a chat over coffee with a warm friend whose advice you've come to value because you know that she knows what she's talking about and has your best interests at heart. Check out her website and sign up for her newsletter, too, with great resources for finding feng shui items. She also runs workshops. She sounds like she has a big heart, which is a good place to start if you're advising anyone on significant life changes.